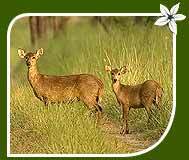 Swamp deer and tiger are the major draws for visitors to the Dudhwa National Park. Located in the state of Uttar Pradesh along the Indo-Nepal border, Dudhwa national park sprawls over an area of around 811 sq km; out of which 648 sq km is the core area. Much of the credit for the development and conservation planning of the park goes to Billy Arjan Singh. Dudhwa sanctuary occupies a position amidst the tropical forests of the terai region, in the foothills of the Himalayan massifs. 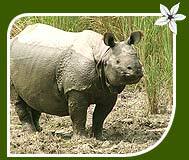 Dudhwa national park is known to harbour more than 37 species of mammals, 16 species of reptiles and 400 species of birds. With grasslands, swamplands and dense sal forests, the terrain of the Dudhwa National Park is as diverse as it is vast. Though tigers and swamp deer are the major attractions for tourists and wildlife lovers, the park has been home to a variety of other mammalian, avian and reptilian species. 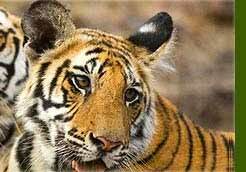 The tiger count at Dudhwa is a good 101. Major animal species that can be possibly spotted here include tiger, leopard, rhino, elephant, barasingha, jackal, sloth bear, sambhar, chital, jungle cat, leopard cat, blue bull, otter, wild boar, fishing cat, ratel, civet etc. The Sathiana and Kakraha regions are well known for sightings of barasinghas or swamp deer. Bird watchers head here for the variety of owl species that are residents to the park. One can easily spot avian species including great horned owl, forest eagle owl, brown fish owl, warbler, bulbul, black necked stork, saras cranes, pitta, painted stork, black partridge, hawk, eagle, hornbill, sun bird etc. Dont miss to visit the Frog Temple at Oyal, en route to the Dudhwa National Park. Dedicated to Lord Shiva, the base of the temple is in the shape of a frog, hence the name. While you are in the Terai region, you should also make a visit to the Surat Bhawan Palace, a famous attraction for tourists. The charm of the palace is heightened all the more by the lush gardens that surround it and by the fountains and swimming pools that lie here. The closest airport from Dudhwa National Park is Lucknow, 250 kms away. Though Dudhwa has its own railway station (Palia, 10 km), the convenient option is Bareilly which has frequent trains connecting to important cities like Delhi and Lucknow. 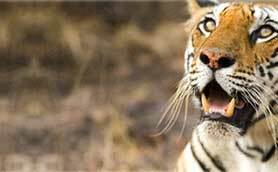 By road, the national park can be accessed from Bareilly, Delhi, Lakhimpur, Kheri, Shahjahanpur etc. Tourists can avail of regular buses and coaches operated by the State Transport Corporation. Holidaymakers and wildlife lovers can plan to stay at the resorts and in the forest rest houses run by the forest department. Your options are as follows.